EIC Elizabeth here. I’m here in my living room, sitting on my couch with a bowl of cheese dip, another of guacamole and am ready to live blog this second session of round two of the Athens regional. You might be wondering why I came out of the woodwork to do my first live blog of the season in one of the last opportunities in 2019. I could give a fake speech about honor and excitement and other emotional things like that, but in reality, we knew we needed to cover all the sessions yet didn’t have enough editors available to do so. So here I am. Let me start by breaking down what to expect from this quad and from my account of it. By all indications, it should be pretty straight-froward, but I’m hoping by stating that right now I’ve jinxed it and the competition will be filled with fun drama. If not, Oklahoma and California are shoo-ins for advancing. Oklahoma would need to have its absolute worst meet of the season while the others have their best. For California, a bars disaster might spell trouble. To be honest, I don’t know much about Maryland, and despite doing my due diligence ahead of time, the descriptions of those gymnasts and routines might be iffy. The same goes for N.C. State, but do note I’ll likely focus on Oklahoma and California anyway, unless something crazy happens and the other teams start making a move into qualifying contention. But stick with me. We’re hopefully in for a wild ride that’s not 100 percent my making. If you want to follow along with scores or video, there’s a number of ways to do so. The live scoring link can be found here and the live stream here (with commentary from THE Kevin Copp). We don’t deserve ESPN’s coverage of NCAA gymnastics. While you’re waiting for this thing to get going, check out our preview of the meet by Mary Emma and Katherine. They discuss some can’t miss routines for those of your tuning in, as well as each team’s chances. Plus, don’t forget about the individuals in this session. Yale’s Jessica Wang (bars) and Temple’s India Anderson (floor) will be rotating with Oklahoma, UNC’s Mikayla Robinson (vault), Brown’s Mei Li Costa (bars) and Pitt’s Brittany West (beam) will be rotating with Cal, Western Michigan’s Rachael Underwood (all around) will be rotating with Maryland and New Hampshire’s Danielle Mulligan (all around) will be rotating with N.C. State. We have some lineups for you guys. Tentative lineups for tonight's NCAA Athens Regional Second Round Session II. We spy Maggie Nichols back in the vault lineup tonight! Of note here is Maggie Nichols back in the vault lineup for Oklahoma. No video yet for me, but I’m going to assume it’s starting soon. Fingers crossed. Word is from my parents in the arena that the touch is still happening, so this thing will kick off momentarily, I’m sure. Lehrmann (OU): absolutely stick Y1.5. Okahoma aint playing, guys. 9.950 for the lead off. Jones (CAL): solid routine going so far. bit of a college sheep. stuck dismount. Webb (OU): a bit short. a couple steps back but not horrid. Clausi (CAL): getting what looks like a really motivating pep talk from Toni before her beam routine and now another from Liz. it’ll be impossible for her to do poorly. switch switch a bit short of 180 on both. bhs loso series is solid. beat jump to side aerial to back full with a hop forward and maybe some chest but a solid routine. Degouveia (OU): Y1.5 with just a hop forward. her normal. Fall from NCSU on bars. Trautmann (OU): Y1.5 with a hop forward bigger than Degouveia’s. Nichols (OU): Well, welcome back on vault. That’s a Y1.5 to stick. Her normal staggered foot landing and maybe a bit far apart too but she manages to cheat the heels together. Keelen (CAL): It was going well but she’s off on her front toss. Dowell (OU): Y1.5 with a step back due to being just a touch short. Overall not a stellar rotation as a whole for the Sooners. The highlights were HIGH but the non stuck vaults were kind of meh, to be honest. So. Seilnacht (CAL): switch a bit short of 180 to double stag ring. side aerial to back full is clean and absolutely stuck. she’s excited coming off that fall from Keelen. Farina (UMD): fall on her final pass. kind of a ran out of energy mistake. Fillard (NCSU): sticks her dlo dismount. another one hoping to right the ship for her team. Shu (CAL): nailed series, hits her side somi. maybe some chest there because all i got was rear end in the camera from my end. side aerial to back tuck full maybe a small foot movement but I’d call it stuck. Just one more and Cal can drop that fall. Anchor for NCSU stick her dismount too, so that’s good news for the Wolfpack who will get to drop that fall. 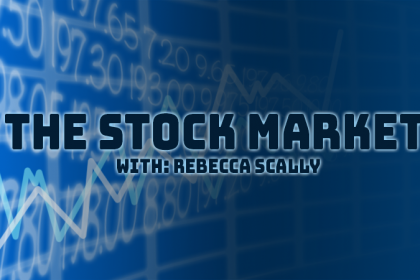 Bordas (CAL): looking confident up there becayse that’s a descriptor you all know the meaning of right? hits her series solidly, leap to double stag ring. i want her legs bent more on that it almost looks like a normal split ring with bent legs, gainer full off the side with a waver of chest but it’s stuck. good finish for the Golden Bears. Mulligan (UNH): swinging a nice routine but does a bling to eagle front giant and can’t make it over and is off. she is competing in the all around so she can come back and at least nail her other events. and now she’s off again. shame. bars is normally her star event. Burgess (UMD): I want to apologize to any Maryland fans because I’m not doing a great job of getting quick hits of those routines in here. The routine was going great here but she’s just a bit short on her final pass of a back 2.5 and sits it. almost looks like she could have tried to save it but who am I to say? That’ll be a counting fall for the Terps though. West (Pitt): I love it when seniors make regionals and get to perform one last routine. starts off with a solid lead series of switch to switch half with some knees. bit of a wobble on her next element, solid bhs loso though but a wobble after she completed it like she was unsure. oh wow a switch 3/4 i’m impressed. you never see that on floor let alone beam. ro 1.5 with a small step to the side. a hit for this individual! Robinson (UMD): Maryland NEEDS a hit here and she’s doing well so far. some energetic dance and whatnot. was that a double or a triple turn? either way I’m here for it. ro bhs 1.5 to front lay is good and she’s done. that was exactly what maryland needed. Underwood (WMU): got to see her in person two weeks ago at MACs, and she’s got a great routine on floor. great front double full to open, rudi to loso is also great—one of my favorite floor passes—she’s got a gigantic bow in her hair. i think it’s giving her powers. some expressive on-the-floor dance now like you do. closes with a rudi (don’t you love that Kevin Copp knows these skill names too?). good routine for her! So despite the score, Oklahoma shouldn’t be happy with that vault rotation. Too many steps and weird landings on most of its vaults compared to normal. Cal will be happy it was able to get through without counting a fall, and same goes for N.C. State. Maryland won’t be pleased at ALL. But remember there’s plenty of time, and anything can happen. Lehrmann (OU): straddled Jeager is good, hit bail handstand and final handstand, half-in half-out is stuck. her usual excellence. So. Seilnacht (CAL): first pass is fine, her leap pass was pretty off kilter on the split angles and rotation, ro 1.5 to front pike is fine. nearly stuck her hand out on her on-the-floor choreo but i don’t think she actually went out. finishes well. Grantham (NCSU): switch to straddle quarter is good, bhs loso nailed, hit routine and she’s pumped. Wang (Yale): maybe a bit short on her first handstand, has a good routine going but bail handstand is overcooked and she has to pirouette out of it then has trouble on the dismount, lands deep, takes a couple steps back then sits it. the good news is she will get to perform with her team next weekend at the USAG national championships, which you should all watch! George (CAL): rudi to open is just a bit over rotated but fine, second pass is a front double full that’s better controlled than the first, last pass is stuck cold. good routine. NCSU actually really doing well this meet. Keeping it relatively close with Cal through this second rotation. Not something many people expected I’d imagine. Mulligan (UNH): Time for a little redemption for her. bhs loso. small wobble and a step back. double turn!!! and it’s hit of course. cat leap to front toss is good. switch to split maybe short of 180. gainer back pike off the end. can we talk about how the eliminated team’s gymnast has to compete with the team that beat it? 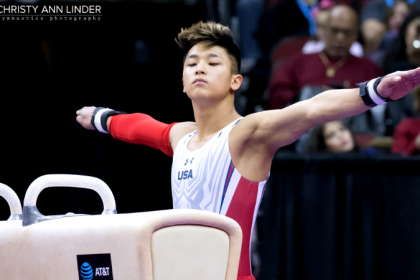 Oklahoma will definitely be much happier with that bars rotation than it was vault. Cal also seemed to get kind of low-balled on floor, but the errors were there to take as well. NCSU is killing it. It got through beam and did it swimmingly. Maryland did better on vault than floor. Bordas (CAL): FTY a hop back and a little uncontrolled. Sy. Seilnacht (CAL): missed this but it was a FTY and I’m sure it was fine. Fillard (NCSU): double pike to open is good and controlled. 1.5 to missed punch and falls on the front tuck out of it. Dowell (OU): front aerial to bhs. connection is solid but she had a bit of knees in the bhs. switch switch is good. full turn fine. full-twisting bhs with a medium wobble but saves it. front full dismount stuck. Jones (CAL): I either missed this one too or the lineup changed. George (CAL): Stuck FTY. Great distance and height too. Another floor conference. And there’s a lot of nothing going on on the other events now too. Thrilling! Clausi (CAL): Y1.5, basically stuck but a the smallest foot movement on the landing that only the judges on one side will have seen. Peterman (UMD): kind of a scary fall on what I thought was her dismount? she peeled it looked like and basically landed on her teammate holding the mat. got back up and hit a fine double layout so she’d ok it seems. Robinson (UNC): fun fact: her sister was a Cal gymnast and she just did vault in Cal’s rotation! FTY with just a hop up and down in place. tons of power. 9.875! That ties her teammate from the first session actually, Khazia Hislop. Barber (UMD): great Tkatchev, misses her last handstand but sticks her double layout. great routine. Backing up a 9.8 from Wright that came after the fall from Peterman. Webb (NCSU): missed her first pass but the landing was solid. second pass is a rudi to double stag. 1.5 to front pike is a bit low in the landing but saves it. Grantham (NCSU): big double tuck with a kick out even. maybe a little uncontrolled on the landing but nothing major. tour jete half to popa is fine. fhs front lay front half with legs apart a little but a hit pass. remember the team opened with a fall so they’re still looking for this last hit. and she gets it. double pike check down and a step forward but a hit routine. Mulligan (UNH): triple full to double full!! fell out of it a bit but who even cares?? 1.5 to front lay is fine for a second pass. you can tell she’s having a lot of fun with this routine in a non cliche way. some people you say that about look miserable in reality. fhs rudi a bit wonky but a good finish for her. Is anyone else getting emotional with all these “final” senior things? Just me? Cool. Oklahoma is on pace for a 198 of course. Cal also in a good position with nearly a point cushion over N.C. State, but Cal finishes on bars, which has been a nightmare sometimes. N.C. State and Maryland actually pretty close even after that rough start from the Terps in rotation one. Will be a fight for third, which matters none but gives the teams something to shoot for. Plus, a play-in team finishing anywhere other than last is always exciting. Cal can be horrid on bars but also its season high is a 49.400. I’m betting on a good night, but we’ll see. Hit and the Bears are through to tomorrow though. George (CAL): a couple of missed handstands, including on her bail, sticks the ftdt landing though. a good routine overall. Jones (CAL): doing a good job with her handstands, incredibly arched pak like her normal, ftdt is absolutely nailed and she’s excited. Cal’s doing this thing. If the team brings this energy in the last rotation to tomorrow, things could stay close for that second qualifying spot. 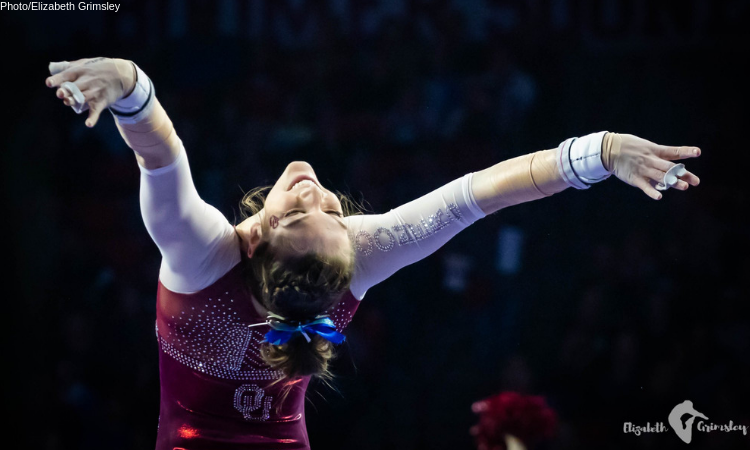 Degouveia (OU): In all seriousness, this is my favorite routine in the NCAA right now. front double full over rotated a bit and steps across her body, front lay to front full is good and controlled, nice leap pass full rotated on the twisting jumps, 1.5 to front lay. another good routine. Kuc (CAL): her lines are just so pretty. a good interior but a hop back on the ftdt dismount. a hit though. Bordas (CAL): nails the landing that will send Cal to tomorrow! Schoepfer (OU): Change in the lineup here. LaPinta was slated to go but Evy is up now. opens with a double tuck with a solid landing. 1.5 to front layout is also good. switch ring to wolf hop full to knee. the ring seemed to lack height. double pike is good. seemed to go back more than up but was a fine landing. 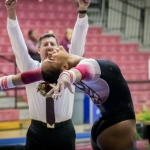 Wright (UMD): nails her beam routine for her team. Costa (Brown): great, clean straddled jaeger, bail to handstand is nailed, missed last handstand and a step forward on her double tuck dismount. Not sure if I saw a stalder or giant full before that so potentially not up to the level? Dowell (OU): Dowell is good and controlled. Sometimes it can be over or under rotated. 1.5 to front lay is perfect like Brenna, always. Maybe a tad short on her leaps in terms of split. front lay to front full to stag is hit and adds yet another great routine. OU will be over a 198 with that, no problem. 9.950, one judge gave a 10. Trautman (OU): Only looking to drop a 9.850. Oklahoma things. Do note that Trautman has a 10 to her name on this event this year. Big double layout to open is good and controlled. front layout to front full to split jump to knee is good. leap series is nice, good amplitude and rotated completely. double tuck to close maybe a touch overpowered but still solid. a great routine. 198.175 before her score. It’s a 9.975. Underwood (WMU): beam series is hit, no problem, straddle 3.4 maybe, the split was definitely not there. sticks her dismount and that’s a hit routine to close out her routine. Anderson (Temple): huge double pike, so much height. Front tuck full through to double full!!! Love that. finishes with a rudi. a bit off kilter and lands short but fine overall. claps from her ending pose. She’s a senior too and closed it out on a great note as well. missed a lot of time in her career due to injury, so you love to see that. So the big storyline is obviously Oklahoma and its 198. But the kicker is that’s not even Oklahoma’s season high. I know, right? Cal also did what it needed to do, but it will want to clean up lots of little things if it wants to contend tomorrow for potentially advancement, especially with a home Georgia team. N.C. State ends up knocking off No. 28 Maryland, which will be a happy end to its season. 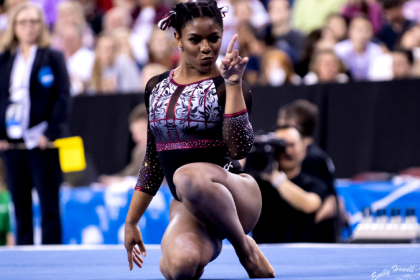 Maryland has not-so-great book ends to its meet with counting falls on floor and beam, but vault and bars were solid. Note: Individual nationals qualifiers will be determined after round three competition by taking the event and all around standings and taking out individuals from the two qualifying teams.